As per the DSC Council, entities in the Northeaster and hill states with an annual turnover of Rs.10 lakhs and above would be required to obtain DSC registration. For all other entities in rest of India would be required to obtain DSC registration, if annual turnover exceeds Rs.20 lakhs. Entities required to obtain DSC registration as per regulations must file for DSC registration within 30 days from the date on which the entity became liable for obtaining DSC registration. With E-Return filing becoming mandatory for Income Tax Assesses with an income of over Rs.5 lakhs per annum, the requirement and prevalence of Digital Signatures has increased manifold. Mybusinessfilings can help you obtain your Digital Signature hassle-free online. Mybusinessfilings is a Registered Partner of SIFY and E-Mudhra. A Digital Signature is the equivalent of a physical signature in electronic format, as it establishes the identity of the sender of an electronic document in the Internet. Digital Signatures are used in India for online transactions such as Income Tax E-Filing, Company or LLP Incorporation, Filing Annual Return, E-Tenders, etc., There are three types of Digital Signatures, Class I, Class II and Class III Digital Signature. Class I type of Digital Signatures are only used for securing email communication. Class II type of Digital Signatures are used for Company or LLP Incorporation, IT Return E-Filing, Obtaining DIN or DPIN, and filing other forms with the Ministry of Corporate Affairs and Income Tax Department. 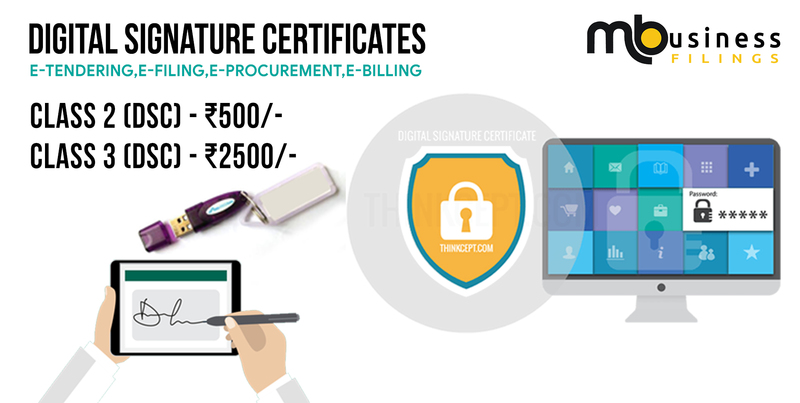 Class III type Digital Signatures are used mainly for E-Tendering and for participating in E-Auctions. Digital Signatures come in the form of a USB E-Token, wherein the Digital Signature Certificate is stored in a USB Drive and can be accessed through a computer to sign documents electronically. With E-Return filing becoming mandatory for Income Tax Assesses with an income of over Rs.5 lakhs per annum, the requirement and prevalence of Digital Signatures has increased manifold. mybusinessfilings can help you obtain your Digital Signature hassle-free online. mybusinessfilings is a Registered Partner of SIFY and E-Mudhra. mybusinessfilings is a Licensed Registering Authority of Sify and E-Mudhra. Therefore, mybusinessfilings can help you obtain Sify or E-Mudhra Digital Signatures hassle-free and quickly. How to apply to DSC Registration in online? you can apply for DSC Registration online. You can simply register your business on the official DSC portal and then scan and upload all the required documents. You will then receive an acknowledgement. A DSCIN will be generated on acceptance of the application and a temporary password and login will be sent. DSCIN is a unique 15-digit ID. Is the DSC threshold limit the same for all Indian states? The exemption limit is a supply turnover of Rs. 20 lakh for businesses in all but the Indian states in the northeast region. Businesses in Arunachal Pradesh, Assam, Meghalaya, Manipur, Mizoram, Nagaland and Tripura must get a DSC registration if their supply turnover exceeds Rs. 10 lakh. As mentioned above, this threshold limit applies only to businesses that operate within their home state. A business that conducts trade with another state must seek registration regardless of turnover. How would the composition scheme work under DSC? Does DSC apply to all businesses? mybusinessfilings.com can help obtain Digital Signature in India. Digital Signature can be provided the next day after application submission. Got questions? Request a call from an mybusinessfilings Business Advisor. The Digital Signature Applicant must submit the Digital Signature Application along with the relevant documents in hard copy format through courier. Once the Digital Signature application is received by mybusinessfilings, the application will be immediately process and Digital Signature will be issued next day. Once the Digital Signature USB token is ready, mybusinessfilings can courier the USB token to your address or hold for pickup at one of our Offices.